TCE & Associate, Inc. | Sanjay Khanna, P.E. Sanjay joined Tadjer‑Cohen‑Edelson Associates in 1986 where he is a Principal in the firm. Sanjay attended the University of Texas on a NSF research scholarship for whom he conducted research and published a thesis on “Stress-Strain Characteristics and Failure Mechanism of Polymer Impregnated Concrete”. 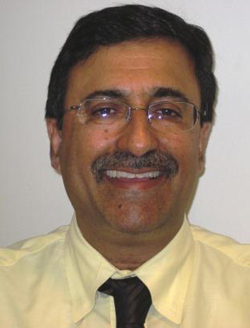 Prior to joining Tadjer-Cohen-Edelson, Sanjay was a registered professional engineer in the State of Texas where he worked for Reynolds Schlattner Chetter & Associates, Structural Engineers located in San Antonio, Texas. Sanjay is involved in the design and renovation of mixed-use development projects, residential, civic institutions, and commercial office buildings; including structural analysis and design, investigation and evaluation of existing structures for renovation and conversion to other uses, and upgrading of existing structures. The design systems utilize structural steel, reinforced concrete, pre-stressed and post‑tensioned concrete, and wood.